You are here: Home » Get Involved » Fundraise » Why Fundraise? Our mission is to enable our community to detect and survive breast cancer by facilitating access to quality care, providing education, and supporting research. 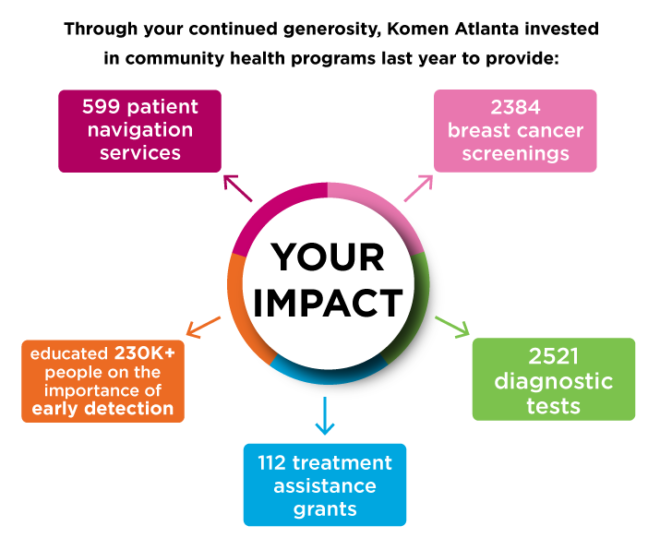 Click here to learn more about what Komen Atlanta is doing in the fight against breast cancer. Why do we fundraise for breast cancer cures? Because today in metro Atlanta, 7 people will be diagnosed with breast cancer. Because every day in metro Atlanta, 1 person will lose their life to breast cancer. Because this week, 19 cases of late-stage breast cancer will be diagnosed in metro Atlanta. Because breast cancer knows no boundaries. It affects people of every age, gender, socio-economic status and location. Because African American women in Metro Atlanta have a breast cancer death rate 40% higher than the national rate. Because it’s time to go beyond breast cancer awareness. It’s time to take action! It’s time to be More Than Pink. Komen events raised more than $2 billion to help fund research, education, screening and treatment. In 1980, the 5-year relative survival rate for women diagnosed with early-stage breast cancer was about 74 percent. Today, that number is 99 percent. Since our founding in 1982, Susan G. Komen’s national research program has invested in cutting-edge research that has helped make major breakthroughs possible. Funding for discoveries in genetics and biology has led to personalized, less-invasive breast cancer treatments to replace the less-effective “one-treatment-fits-all” approach. This is your opportunity to turn your support for the breast cancer movement into action. Prove that you are More Than Pink, and help us end breast cancer forever.